Hi there. I know it’s been a long time since we’ve seen each other, but this is just a friendly note to say COME BACK NOW. Or else. I was pretty sure there for awhile that you were trying to come. I saw the first daffodils in bloom this weekend, but then Winter showed up again and scared you off. Stop being a whimp. Stand your ground. Because I am officially tired of all my winter clothes and I am almost at the point of wearing sundresses with mismatched winter sweaters a-la-Lorelai Gilmore. You do not want that fashion disaster on your conscience. I’m tired of my flannel sheets, my flannel pants, my puffy coat, and my sad winter dry hair. I want to use my porch for more than bike storage. I think I can take the liberty to speak for everyone when I say that WE ARE READY. Ok thanks. Glad we got that cleared up. 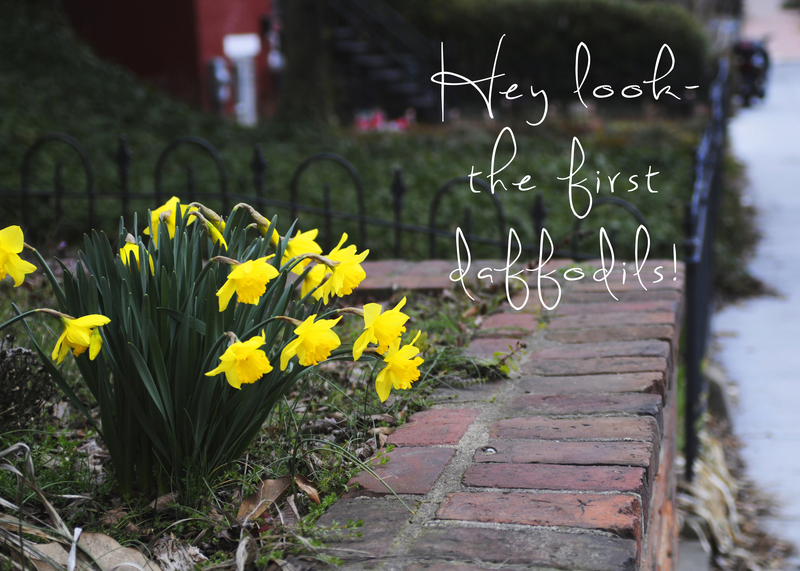 This entry was posted in Uncategorized and tagged daffodils, flowers, photography, seasons, spring. Bookmark the permalink. 4 Responses to The Harbingers of Spring…maybe. Amen!! I am already at the point of trying to pair summer skirts and dresses with winter sweaters and make them look like they are meant to be that way. Unfortunately, apart from some sunny (but still cold) days and bird’s eggs falling on my porch (the pigeons haven’t quite mastered the art of nest building yet…), there are no signs of spring yet in Central Oregon. Actually, wait. I did see a very cute, very tiny calf in a field yesterday, so maybe spring is getting close! Baby cows MUST mean it’s coming!! !